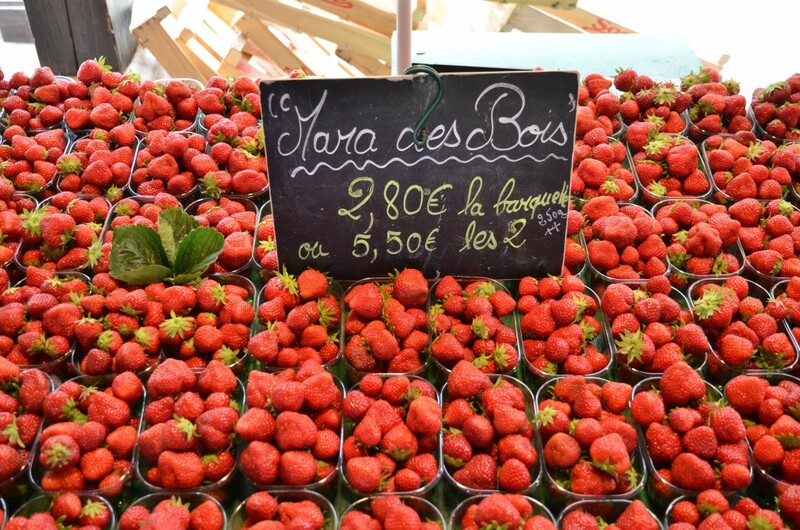 The Mara des Bois Strawberry has been cherished in France since its introduction in 1991. The delicious, acorn-size fruits are highly perishable so they’re found only in farmer’s markets and private gardens. Here, a bumper crop was on display in a market in Deauville, France. Photo by Gabriella Pirisi / misspirisi.com. Part of the fun of working in the nursery business is finding new plants to offer our customers. But finding a plant is not always as simple as being shown new offerings in a grower’s greenhouse. In the case of one of our favorite edibles, the Mara des Bois Strawberry, we discovered it by happenstance when White Flower Farm’s owner, Eliot Wadsworth, heard mention of a delicious, aromatic strawberry that was wildly popular in France. Introduced by a French nursery in 1991, the berries of the Mara des Bois plant are a treasure to be found only at farmer’s markets (where they bring a premium price) and in patches maintained by backyard gardeners. The reason? The berries are highly perishable, which means they have no shelf life in grocery stores. Mr. Wadsworth thought the berries would be a terrific choice for home gardeners who could harvest and eat them right away. That is, provided the berries lived up to their billing. Mr. Wadsworth asked Rob Storm, the farm’s director of horticulture, to “chase” the plant. Rob chases any number of plants in a given year. If he or another staff member sees a particularly desirable plant while in Holland or when touring a garden or garden show, notes are made, photos are taken, and contacts are sought. Tracking down a plant and finding a reliable source is a process that, in some cases, can take years. The chase for the Mara des Bois happily went a bit faster than that. Runners from the plants we grow in strawberry jars sometimes escape and begin growing in the cracks of our stone walkway. Rob began by talking to representatives at various strawberry seed houses in the United States, England, France, and Germany. These outfits grow plants strictly for purposes of collecting seed. None of their representatives had heard of Mara des Bois Strawberries. Rob next called several universities. Ultimately, he found a researcher at a branch of the University of California who knew a man who worked as a “fruit finder,” searching out interesting fruits from around the world in order to write about them for various periodicals. The fruit finder had, indeed, heard of Mara des Bois, and he kindly steered Rob to a grower who was importing France’s acclaimed Mara des Bois Strawberry into the United States. At the time, the grower was selling plants only to farmers who would then offer the berries at same-day farmer’s markets. Rob asked for a few trial plants. 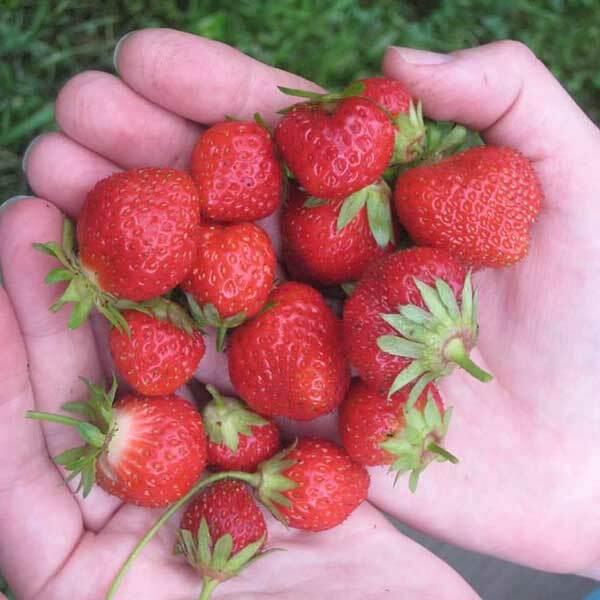 The Strawberries were planted in our Connecticut gardens, the berries were harvested, and the results exceeded our expectations. Mara des Bois produces an abundance of acorn-sized, aromatic fruits that are juicy, ripe red all the way through, sweet and delicious. Mara des Bois is a distant relative of the Woodland Strawberry, and it produces an abundance of acorn-sized, aromatic fruits that are juicy, ripe red all the way through, sweet and delicious. When the first handfuls were tried around here, staff reactions were almost always the same. Eyebrows shot upward and smiles appeared. With these kinds of results, Rob went back to the grower and asked if he’d be willing to build up stock so we could offer the plant to our customers. The grower was happy to oblige, and ever since, White Flower Farm has been offering the Mara des Bois Strawberry. Nine years later, it remains a favorite of customers and staff. 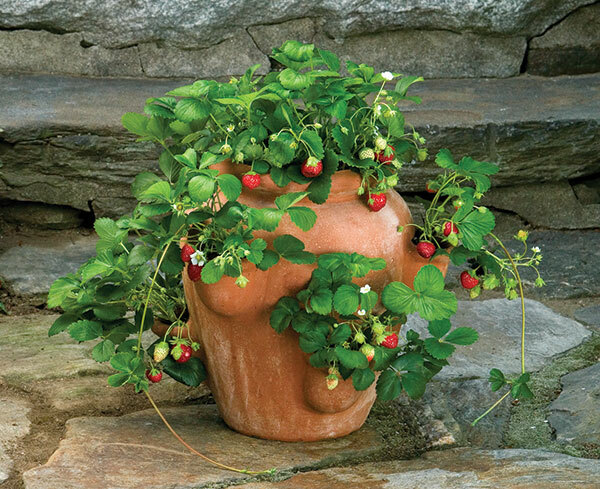 The plants can be grown in gardens, hanging baskets, and strawberry pots. Planted in full sun, they vigorously send out runners (side stems with daughter plants attached). This makes the plants especially productive for home gardens and containers. We keep a healthy crop going in strawberry jars around the greenhouses, and staffers who are making their rounds pick and eat the berries all season long. In one spot near our shed, runners have escaped the pots, and now new plants are growing in cracks along the walkways. Mara des Bois is a favorite of customers and staff. The plants can be grown in gardens, hanging baskets, and strawberry pots. 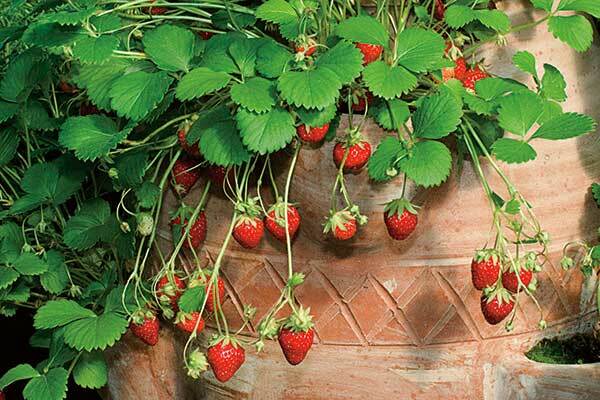 Strawberries thrive in well-drained soil that is rich in organic matter. Beyond that, they require only regular watering to produce a profusion of sweet, delicious fruit. All told, the chase for Mara des Bois took four to five months, and then another year before the plant appeared in our catalog. One taste of these delicious berries and you’ll know, the chase was worth every minute. Read here for specific advice on planting Mara des Bois in your garden or a hanging basket or a Strawberry jar. For more information, visit our website.